With a child on one knee and a book propped awkwardly on the other, Hillel Cooperman sat in front of a computer camera in Seattle and Skyped with his parents on the east coast. He wanted to share the bedtime story experience with his children and their grandparents, but found connecting over the miles awkward and frustrating. The online approach was a step ahead of the videotaped attempts they had made through the years, but there wasn’t much about the modern story-sharing over distances that felt simple. Recognizing the shrinking window of time in which his children would be interested in sharing storytime, Cooperman wanted to make the process better. He thought to himself, “I make software for a living, why am I doing this the hard way.” So in 2011, Cooperman, creator and founder of the Artisan Software Company, Jackson Fish Market, and a ten-year veteran of Microsoft, created A Story Before Bed for the iPad, and launched a virtual, recordable story-sharing experience. Prompted by the desire to connect grandparents to their grandchildren, he wanted a digital version of storybooks to be accessible on both ends of the long-distance connection. “It is about connecting grandparents with kids, but it’s even more about preserving a memory,” Cooperman says. With built-in recording capability, the digital story-sharing experience can be archived for generations to come. The digital version of the book moves at the prompting of the person recording the reading. 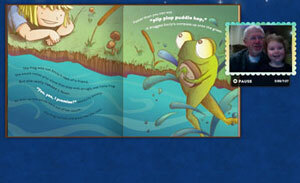 Children can watch the reader and the digital book at the same time. The desire to keep record of adults reading a story specifically for a loved child has proven to be a powerful tool to bridge any physical distances families have to face. The nonprofit organization United Through Reading recognized the power of shared reading experiences when the organization was founded in 1989 to promote shared reading for military families. Without the technology available today, the group set up video-recording stations around the world so military personnel could record themselves, initially on a VHS tape, reading to their children. The children are now provided a DVD of their parent reading as well as a copy of the book. There are currently 200 reading recording stations worldwide, and the impact has been incredibly positive for the more than 1.3 million people who have benefited from the program. Holding the physical book while watching mom or dad read the story on the other side of a television screen will become one of the reading memories for military children who have been a part of United Through Reading. Cooperman believes in the power of the story, even if for him it does not need to happen with a physical book. “It’s about celebrating the experience,” he says. Cooperman also hopes to provide reading memories for military families through the free recorded stories offered at A Story Before Bed. Cooperman’s company has been able to provide more than 100,000 free recordings to military families since 2011. For those of us born before 1980, nostalgia about reading as a child is about the remembered physical experience: the touch of an adult who held us on their lap, or the physical turning of pages. Very few people recorded the experience, and the memory is all most people carry with them about childhood reading experiences. Times have changed, and the capability and common-place practice of recording life has altered the story-sharing experience for everyone. Some families choose to share stories via Skype or record themselves reading on YouTube. Hallmark continues to publish large recordable storybooks that can be mailed to loved ones. But overall, it is about finding a way to share recorded stories with kids. Adults have shared stories with children for as long as there have been stories to tell. And thanks to software developer dads like Cooperman, we’ll have the technology to continue to share them for generations to come.